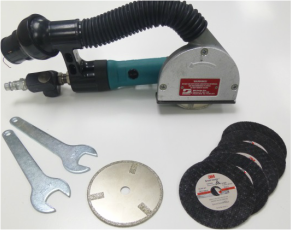 When you need to cut through a thin or thick laminate or sandwich panel very quickly, these tools are the most effective when it comes to speed of cut and finish. 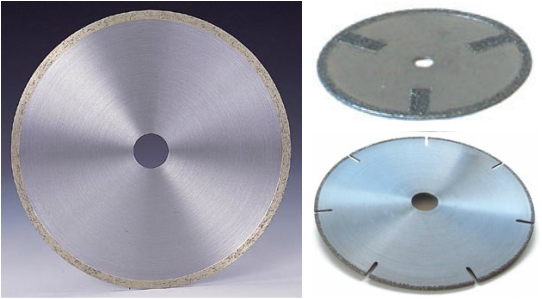 The diamond discs are well suited to thermoset composite materials and the 3M GreenCorps discs are highly effective over a wide range of materials. The extracted tools are very effective at dust capture at source to make for a clean working environment. If you would like to know how to use these tools most effectively, our course DMSC57 covers all you need to know. 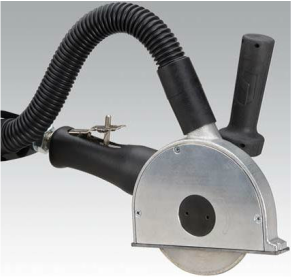 The direction of rotation of the disc throws dust up into the vacuum shroud providing effective dust capture at source when combined with a portable dust extractor. Can be used for production and on-site cutting activities. Maximum depth of cut 17mm / 11/16"
Prices stated are our discounted Payment on Order/Website Prices. List prices are between 5-9% higher. A very versatile cut off wheel that is best used in production with a downdraft extraction unit. 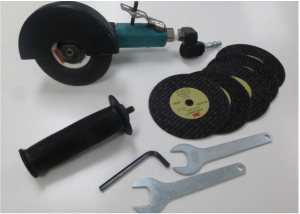 Very effective when cutting through a mix of materials including carbon, glass, aramid, core, metal inserts etc. Maximum depth of cut 30mm / 1 3/16"
To get the best performance from this cut off wheel, it is best used with 3/8" high flow connections with a 10mm/3/8" ID airline. Price stated is our discounted Payment on Order/Website Price. Standard List Price is £1,025.00 plus VAT (where applicable).